A policeman stands guard near the air-control tower of a airport following a suicide bombing near the African Union's main peacekeeping base in Mogadishu, Somalia, July 26, 2016. The United States has condemned "in strongest terms" a double bombing that took place at the main entrance of Mogadishu's airport during morning rush hour Tuesday, killing at least 13 people. A spokesman for the U.S. National Security Council, Ned Price, said Tuesday that the United States "stands squarely with Somalia and our partners in the fight against despicable acts of terrorism that seek to destabilize Somalia." He said the United States remains "committed to helping Somalia progress along a path towards peace and prosperity and the defeat of terrorist groups." Al-Shabab - Somalia's al-Qaida-linked terror organization - claimed responsibility for the attack on the group's Andalus radio station. Seven of the 13 people killed were United Nations guards, the security officials said. 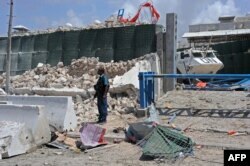 A Somali soldier stands next to a crumbled perimeter wall outside the UN's office in Mogadishu on July 26, 2016 following twin car bombings. The entrance targeted in the bombing is regularly used by employees who work at the airport and is located near U.N. and African Union (AU) buildings that connect to the airport. Residents in the area reported hearing two massive explosions just around 9 a.m. local time. 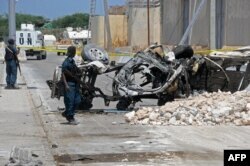 According to reports from the residents, a suicide bomber tried to drive a car packed with explosives through a Somali security check point and then detonated the explosives causing casualties. Seconds later another car arrived and this time the suicide bomber detonated the car close to security forces and nearby African Union forces. Somali soldiers pass near the wreckage of a car bomb outside the UN's office in Mogadishu on July 26, 2016. A security source told VOA that private security guards charged with protecting U.N. personnel outside the AU compound were also at the checkpoint at the time of the attack. It's not yet known if any U.N. officials were preparing to leave the airport at the time of the attack. The private security detail escorts U.N. officials and vehicles outside the airport perimeter. Security sources say attackers did not breach the perimeter of the airport which partially hosts the main Headquarters of the AU as well as foreign embassies.